Publius Licinius Valerianus, Valerian, Roman Emperor born c. 200 - died c. 260 was Roman Emperor from 253 to 260. He was taken captive by Persian king Shapur I after the Battle of Edessa, becoming the only emperor to do so and causing wide range instability across the empire. 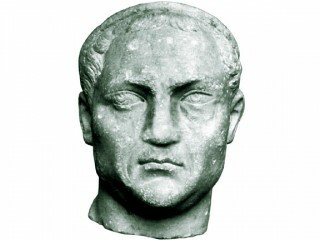 The Roman emperor Valerian, or Publius Licinius Valerianus, attempted to stay the advances of the barbarians and the Persians on Roman territory and was a vigorous persecutor of the Christians. The background of Valerian prior to his accession as emperor is uncertain. He had evidently had both civic and military experience and had served with sufficient distinction to be awarded the consulship. He was popular with the Senate. One source mentions him as part of a delegation coming from North Africa to support the usurping Gordian emperors against Emperor Maximinus Thrax (238). He probably held an important position under Emperor Trajan Decius (249-251), and there may be a connection between his service under that emperor, a persecutor of Christians, and his own anti-Christian activity. Valerian must also have been highly regarded by Emperor Trebonianus Gallus, for when Gallus was challenged by the usurper Aemilianus, Gallus had Valerian gather troops for him in the northern provinces. Valerian was in the province of Raetia (modern Switzerland) when the news of Gallus's murder by his own troops reached him. Valerian was then saluted as emperor by his own army. Shortly thereafter, the troops of Aemilianus slew their commander and went over to Valerian. He was also accepted by the Senate in Rome. Almost any emperor in the mid-3rd century faced an impossible situation. The frontiers were thereatened in almost every sector either by barbarian hordes or by the growing power of the Sassanian Persian kingdom. It was impossible for an emperor to cover every frontier; yet to delegate authority meant to create a potential rival who after a few victories might attempt to make himself emperor. Valerian attempted to solve this problem by associating with him in the honors and powers of the emperorship his son Gallienus. Gallienus became in fact almost a coregent. A second major crisis of the empire was that of spiritual values. Traditional Romans regarded traditional religion as one of the foundations of their success, but this religion was being challenged by many sects, especially the Christians, who seemed most opposed to normal Roman religious practice. Sporadic efforts were made to control or exterminate the sect but without success. Valerian is supposed to have been initially sympathetic to the Christians, but by the 4th year of his reign (257) his attitude changed. He may have felt it important in a period of crisis to have maximum support for the Roman gods. An edict directed primarily against the clergy was issued. It required them to show some form of veneration for Roman ceremonials and prohibited all types of Christian services, including those at cemeteries. This was followed by a second edict, which imposed various sentences against Christians, including death for bishops and other ecclesiastical officials and loss of rights and property for lay Christians. Many individual Christians suffered from these decrees, but they failed to stop the growth of the religion. Meanwhile, foreign problems took the attention of Valerian. The Persian king Shahpur I had raided the Eastern provinces and seized Antioch, the third-largest city in the empire. In 256 or 257 Valerian went to the East. Shahpur yielded Antioch, but Valerian found himself faced by a continuing Persian menace and also an incursion of the Goths into Asia Minor. In spite of the fact that he had no generals he could really trust, Valerian dispatched forces against the Goths. Valerian's own armies were weakened by a plague, but nonetheless he was forced to return to the Persian menace, which now centered upon the city of Edessa. While trying to relieve the city, Valerian was captured by Shahpur. The circumstances of his capture are uncertain. Some sources say that he was seized by a ruse, and others that his army was overwhelmed. In any case the Persian king was extremely proud of his prize and carved monumental cliff reliefs showing Valerian kneeling before him. Christian writers depict a harsh captivity for Valerian, but this may reflect a desire to see justice done by God for Valerian's persecution of the Christians. Whatever the circumstances, Valerian seems to have died within a short time of his capture. His son Gallienus succeeded him. View the full website biography of Valerian.